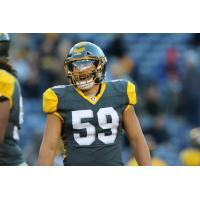 (SAN DIEGO, CA) -- The San Diego Fleet was well represented by The Alliance of American Football on Tuesday, as running back Ja'Quan Gardner was named Offensive Player of the Week and linebacker A.J. Tarpley was chosen as Defensive Player of the Week following the Fleet's 31-11 victory over San Antonio on Feb. 24. This marks the first time in the team's young history that a Fleet player has earned weekly honors. Birmingham punter Colton Schmidt rounded out the selections as Special Teams Player of the Week. RB Ja'Quan Gardner turned in a record-setting performance on Sunday. Not only did the 23-year-old notch the longest scoring play in Alliance history with an 83-yard touchdown run in the third quarter, Gardner also set an Alliance single-game rushing record with 122 yards (on just 12 carries). Additionally, he added a pair of catches for 21 yards. After posting 104 rushing yards on Feb. 17, the native of Ceres, Calif., now owns the top-two, single-game rushing totals in the league this season and is the only Alliance player with back-to-back, 100-yard rushing performances. His league-best total of 281 rushing yards is 93 yards clear of the pack and his average of 8.0 yards per carry is the highest among all players with 10+ rushes this season. While at Humboldt (CA) State, Gardner set program records for career rushing yards (5,495) and touchdowns (76) and was a two-time All-Great Northwest Athletic Conference Offensive Player of the Year (2015, 2017). In addition, he led the nation (Division-II) in rushing with 2,266 yards in 2015. Gardner spent time in NFL training camp with the San Francisco 49ers this past summer before being released at the start of the season. LB A.J. Tarpley reversed the tide Sunday with a 27-yard touchdown on an interception return in the second quarter that proved to be the game-winner (San Antonio held an 8-6 lead at the time). The pick was the first of the year for Tarpley and the defensive score was a first in team history. The 26-year-old also finished with five tackles -- one for a loss -- and a pass defended. He now owns 13 tackles through three games this season. A product of Stanford (CA) University, Tarpley signed with the Buffalo Bills as an undrafted free agent in 2015 and turned in a productive NFL rookie season. He appeared in 15 games (two starts) and recorded eight tackles, five sacks, two forced fumbles and two interceptions. However, the Plymouth, Minn., native retired from football the following April after having suffered his third and fourth career concussions. The Fleet opener in San Antonio on Feb. 9 marked Tarpley's first professional football action over a span of three years, one months and six days. The Fleet (2-1) is back in action with a road game against the Memphis Express (0-3) on Saturday. First Snap is scheduled for 3 p.m. CT (1 p.m. PT) at Liberty Bowl Memorial Stadium in Memphis, Tenn. The contest will stream live on Bleacher Report (B/R Live). The Fleet will return home to host the Salt Lake Stallions (1-2) on Saturday, March 9, at 5 p.m. at SDCCU Stadium. Tickets for this game and -- all other home contests -- are available here.